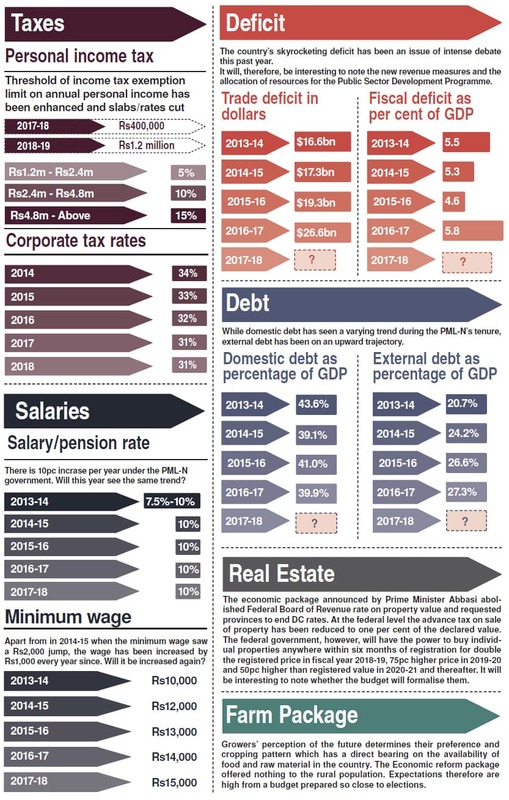 Don't get confused by the numbers in the budget speech — here’s what you need to watch out for to assess the impact. Thirty-four days before its five-year term ends on May 31, the PML-N government will present its sixth federal budget that will become operational in the next financial year starting July 1, 2018. WITH the federal budget announcement only three days away, farmers are holding their breath, not knowing what it would mean for them. Caught between their expectations and harsh economic realities of Pakistan, they are keeping their fingers crossed. However, those involved in some kind of pre-budget discussions, or lobbying, with official financial wizards think that it would be, by and large, a repeat of last year as far as the incentives and subsidies for the sector are concerned. They believe that the government does not have fiscal space to expand the subsidy regime or change the taxation regime. Besides, it would be equally difficult for it to withdraw incentives that it gave last year — especially in an election year. The overall picture, thus, would remain the same. But still, farmers did present a charter of demand during their meetings with the prime minister, asking for a range of subsidies and tax relaxations to off-set the impact of a deteriorating rupee, expanding international prices of some imports (like pesticides) and increasing diesel prices, which, put together, are expected to raise their cost of production next year. Their charter of demands included cutting the general sale tax (GST) on fertiliser to a uniform two per cent and the income tax, which the government collects at the port on imports, to zero per cent. They also want the government to provide gas to three urea plants that have been closed owing to gas shortage, or allow imports. Similarly, they want all regulatory duties be withdrawn on pesticides and the impact of increase in international prices be bridged through subsidies. Farmers also seek a flat rate of Rs4 per unit for agriculture tubewells. They also want the government to fix the support price of all big crops (cotton, potato, maize and rice), provide gypsum free of cost to treat soils for poor health, and cut GST to 2pc on the import of agriculture machinery. On its part, the government is only considering a reduction in GST on fertiliser for its own reasons. Federal officials, along with farmers’ bodies, think that cash subsidies do not fully benefit farmers, especially smallholders. For this reason, it is likely to bring varying rate of GST (4pc to 11pc on different fertilisers) to a flat rate of 2pc because it would only adjust Rs52 billion subsidy, which it granted last year and intends to continue this years as well, with reduction in tax income. Government officials, however, believe that the price of urea may have to be increased to Rs1,500 this year instead of Rs1,400 per bag last year even after this GST adjustment. It is because of expensive liquefied natural gas (LNG), which is now costing the industry a little over $10 per million cubic feet (mmBtu) against the $5 per mmBtu price of natural gas. So, despite this tax adjustment, farmers may still end up paying Rs100 more on a urea bag — or an overall burden of Rs12bn, given the national consumption of urea at 120m bags. An increase in the cost of production might also come from pesticides, which saw their basic poisons freed of GST last year but have around 20pc regulatory duty on other ingredients, which form 30pc to 35pc of the cost of production. Global prices of basic poisons have also gone up by 80pc in the last one year. Add the impact of 11pc rupee depreciation in the last few months and pesticide prices could go up by 80pc to 90pc, as compared to last year. Pesticide prices have already gone up by 25pc to 30pc, as market competition is not allowing manufacturers to pass on the entire impact to consumers. But they would certainly rise once budget is passed and no remedy is found in it. This is the area where farmers want the government to intervene and keep prices to a minimum. Government officials claim that the subsidised tariff on agri-tubewells would stay at Rs5.35 per unit for off-peak hours at the estimated cost of Rs27bn to the national exchequer. The subsidy on concessional loans (that came through agriculture development and national banks at 9.9pc) to small farmers (up to 12.50 acres) might also stay and so would be duty relaxation on the import of agriculture machinery and seeds. This relaxation helped the country when the Pakistan Bureau of Statistics reported 31.98pc increase during the first quarter of the current fiscal year (July-September) as compared to the same period of last year. According to the bureau’s data, agricultural machinery worth $42,733 was imported during the first quarter as compared to $32,378 a year ago. BUSINESSPERSONS expect the Pakistan Muslim League-Nawaz government to sort out at least some of the issues — such as those related to higher tax burden on firms, unaffordable energy price, unpaid tax refunds and export rebates, etc — in the budget next Friday, its sixth and last before the new elections this summer. Large corporations, including foreign companies and banks, are expecting the government to implement wide-ranging tax reforms stating abolition of three to four per cent super tax imposed, reduction in corporate income tax rate to 25pc and sales tax to 13pc in the new budget. “We have suggested a number of proposals to cut the tax burden on companies. 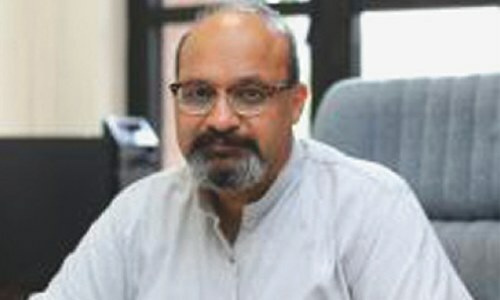 We understand that it won’t be possible for the government to incorporate all the suggestions in one go but the abolition of super tax on large firms and reduction in corporate income tax can prove to be the first step,” says the chief executive officer of a food company, which is member of both the Overseas Chamber of Commerce and Industry (OICCI) and the Pakistan Business Council (PBC). He concedes that the implementation of these proposals will result in a significant loss of tax income to the government. However, he adds, it could also serve as an incentive for the country’s tax authorities to expand the narrow tax base by documenting the informal sector that remains outside the tax net so far. “The solution to our fiscal woes is not in taxing the already taxed sectors of the economy. The solution lies in increasing the tax base by taxing the untaxed businesses. “Besides, the reduced taxation will increase corporate profits and encourage companies to invest in capacity expansion and Greenfield projects that will ultimately boost the government’s tax revenues and create jobs. It will be a win-win situation for everyone,” the CEO notes, requesting anonymity. The government had imposed a super tax in 2015/2016 for one year but has been extending it ever since. Moreover, the chunk of direct and indirect tax income is collected from the organised sector while a large portion of the economy operating in the shadows continues to enjoy a virtually a tax-free status. 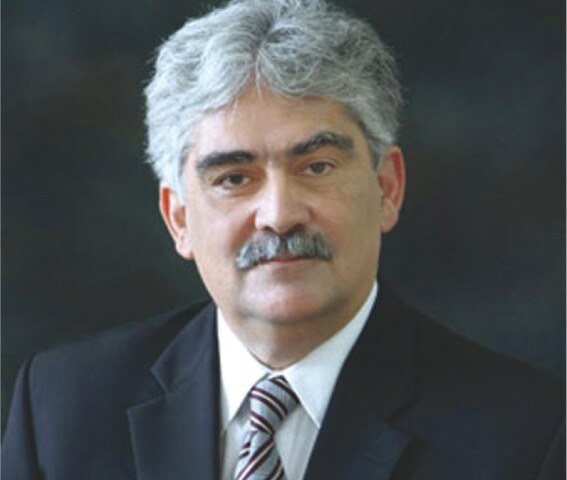 Pakistan Textile Exporters Association (PTEA) Chairman Shaiq Jawed wants the government to announce a combination of policies that will reduce external sector vulnerabilities in its last budget. “The budget must focus on mitigating the balance-of-payments crisis staring us in the face,” he says. “It means we must encourage exports in order to narrow the trade deficit. And when we talk of exports, we, fortunately or unfortunately, have only textiles to raise our exports in a meaningful way in the near future,” he continues. Pakistan’s current account deficit has gone up to $12.0bn in the first three quarters of the present fiscal year on the back of growing trade deficit of $26.2bn as the country’s exports in goods and services stand at $21.8bn and imports at $48bn. “In our meeting with Prime Minister Shahid Khaqan Abbasi and his Advisor on Finance Miftah Ismail, we requested them to cut the cost of energy for the industry to make us competitive in the region. “We have asked them to remove the Rs3.50 per unit surcharge that has been levied to recover line losses and electricity theft, and cut gas prices in Punjab to Rs600 (the rate at which the industry in Sindh and Khyber Pakhtunkhwa is getting gas) to help us reduce our high cost of doing business. “It is because of higher-than-the-regional average energy prices that our products have become uncompetitive in the world. 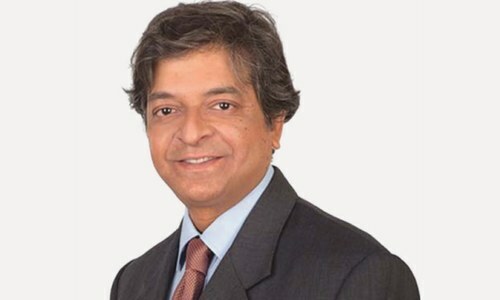 Additionally, we want the government to release the long unpaid tax refunds and export rebates as it is causing a liquidity crunch for exporters and impeding our overseas shipments,” says Shaiq Jawed. Syed Nabeel Hashmi, who supplies automotive parts to the country’s car and tractor makers, says Pakistan is now passing through a phase where its macroeconomic indicators are reflecting difficult times. He is of the view that the government should make policies that push direct tax collection and reduce the burden of indirect taxation on businesses and individuals by restructuring the tax regime and administration. “Taxpayer should be facilitated and not penalised. The budget should be rewarding for taxpayers and tough for those who don’t pay their share of taxes. Tariffs on raw materials should be rationalised. The budgetary process has tended to go out of control in recent months. By the end of the current fiscal year the consolidated fiscal deficit is likely to approach 6.5pc of GDP, compared to the deficit target of 4.1pc of the GDP. The expansionary nature of the on-going fiscal policy is inevitably adding to aggregate demand and putting pressure on the import bill, thereby exacerbating the problem of a large and growing current account deficit. Given these conditions, it is indeed surprising that the lame duck government still wants to present a sixth budget at the fag end of its tenure. The reasonable expectation is that the budget strategy in 2018-19 must be to bring down sharply the deficit back to about 4.5pc of the GDP. This would necessitate unpopular taxation measures and expenditure cuts on the eve of the elections. This task could better have been left to the successor Government. Planning and formalising a full year budget, when the market is still unconvinced about how this government intends to manage the external deficit, and the vicious borrowing cycle that the country has entered, defies logic. With the IMF hinting that Pakistan needs to refocus on stabilising the macro economy and follow through on incomplete reforms (a not so subtle hint that we need another stabilisation programme), what credibility will this budget have? We do not know how the country will finance its external payments in FY19, what the IMF will provide to tide us over, and also how narrow the current account deficit would have to be — so how can our planners put forward an economic plan that is internally consistent with credible financing sources? In our view, the Budget for FY19 is a political stunt to get mileage for the next election. government has an incentive to increase expenditures so as to woo voters. The result of the above will be increased budgeted fiscal deficit for next year. The government will justify it by saying that it is using expansionary policy to ensure that GDP growth targets are met and the rising growth rate does not falter and fall again. The government has no commitment towards the budget. It cannot have any commitment towards it because it won’t be implementing it. A new government will. Besides whatever changes had to be made were made with the amnesty announcement which was a mini-budget of its own. It’s very convenient to issue a budget but the new government that comes will change it. In any case the country will enter the IMF programme sooner or later and then a new budget will be announced to support it. This budget is no big deal. It has no meaning at all. “The budgets over the last five years have all but hurt the stock market,” laments a senior stock broker. Past performance leaves him with little hope for the upcoming budget 2018-19. Like Oliver who “asks for more”, the Pakistan Stock Exchange (PSX) has once again put forward the begging bowl. But the government might all but pull its pockets inside out. No one really believes that the corporate tax rates would be trimmed and there are slim chances for a change in the Super tax regime. In their April 19 ‘strategy report’, brokerage BMA Capital Markets observed: “Two key areas for excitement are potential favourable changes in taxation regime on sources of equity returns (such as capital gains tax, dividend yield and stock split) and the passage of the Amnesty scheme. But where several proposals of the PSX may be turned down by the government, it makes sense to provide incentives for companies to seek listings. The Exchange has proposed that tax credit of 20 per cent be allowed for five years from the tax year in which a company is listed on the bourse. “Companies would be happy to float Initial Public Offerings only if they are convinced that the benefits and returns outweigh the risks and potential hazards of going public,” says a senior market participant. Optimists are cherishing hopes of huge inflows in stocks in case the Amnesty Scheme gets through, for where else would it be safer to invest laundered money? The taxmen can keep an eye on the property acquired and it is never safe to hide heavy sums under the mattress. The number of companies listed on the PSX is abysmally low at 559, representing a decline from 638 corporations that were traded on the exchange six years ago. On the other hand, the number of firms seeking registration at the Securities and Exchange Commission of Pakistan (SECP) has forever been on the rise, the current tally being over 100,000 which produces the ratio of registered to listed companies at 180 to one. This puts prospective equity investors at a disadvantage since they have few options and a lot of liquidity chases only a few blue-chip shares. It also triggers intense volatility in the market. 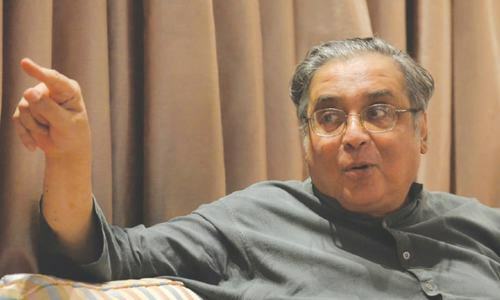 Muneer Kamal, chairman of the PSX board, told this writer that prior to the retreat of the stock market in May 2017, companies were lining up for listings, however, most had to put their plans on hold for fear of under-subscriptions. The PSX chairman’s statement is corroborated by the ‘daily quotation sheet’ of the Exchange. On May 25, 2017 at the height of the bull market when the KSE-100 index hit the all-time high of 52,876 points (having reverted to settle at 45,388 points last Thursday), as many as 17 companies were in line who had “Applied for listing”. Those vying to enter the capital market at the time included: Dalda Foods Limited; Inbox Business Technologies Limited and a host of funds in Prosperity Planning: Gold Fund; Energy Fund; Capital Protected Fund; Active Allocation Fund; Asset Allocation Fund; Strategic Allocation Fund; Treasury Fund and privately placed Sukuk. The current ‘quotation sheet’ shows approval to issue prospectus (offer for sale) given by the PSX to seven companies: At-Tahur Limited; Hira Terry Mills Ltd; Dalda Foods Ltd; Liberty Power Tech Ltd; Unicol Ltd; TPL Life Insurance Ltd and Inbox Business Technologies Ltd. Yet, most are waiting for a turn in the tide of the market before asking investors for cash. Regulators as well as investors eye with envy hundreds of prosperous companies in cellular, pharmaceutical, fast-moving consumer goods and other sectors that make tonnes of money in profit but keep it all for themselves, loathe to share by going public. Several established companies such as Unilever have even sought stock market de-listings. While the motive of such companies may be considered selfish, it does make investment sense. In a low interest rate environment banks pester big conglomerates and powerful companies offering them money at minimal interest rates. Why then must such companies enter the capital market to mobilise funds and get trapped in the hassle of dealing with rowdy public shareholders in annual general meetings? And get inundated with tonnes of paper work required under the ‘code of corporate governance’, running the risk of punishment at the slightest error? But the corporate disenchantment with listing is not Pakistan specific. Globally, corporatisation is giving way to sole-proprietorship. The Wall Street Journal makes a stunning disclosure in an article in its Jan 4, 2018 issue: “In 1996 more than 7,400 companies were listed on US stock exchanges; today that figures is less than half”. A year ago, the Journal wrote that since the financial crisis, the equity market had become bifurcated with a private option available to select investors and a public one that was more of a last resort for companies. “America’s Roster of Public Companies is shrinking before our eyes,” The Journal affirmed. It is understandable then that persuasion and incentives are the only means of bringing more firms under the fold of the equity market. “Revert to say one to two per cent lower tax rate on listed companies over unlisted firms seems justified”, says a local fund manager who looks after Rs12 billion of public money in equity, bond and money market funds. Dawn always brings new, i have learnt many things by DAWN..
Applaudable efforts by Dawn. Excellent visual analysis of data.